Submission of declaration application for product certification. Review of the declaration application to make a decision on russian certification procedure and to choose a russian certification scheme. Selection of the test center or test laboratory. Development of product certification program and methods. Selection, identification of the specimen (samples). Testing (examination) of the products for russian certification purpose. Analysis (inspection) of production conditions. 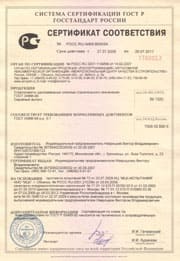 Analysis of the test results and production examination report to make a decision on possible issue of the russian certificate of compliance or license certifying the right to use russian certification accordance mark. 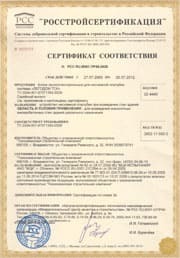 Russian certification of manufacturing process of the certified commercial goods or russian certification of the declarant’s quality system (if it is included into the russian certification plan or at the declarant’s desire). Drawing up and registration of the manufacturing process or quality system Accordance Certificates, and entering the certified manufacturing process or quality system into the State Certification System Register GOST R.
Receipt of the russian certificate of compliance for manufacturing process of the certified products or declarant’s quality system. 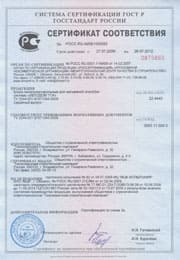 Drawing up and registration of the russian certificate of compliance for products, and entering the certified products into the russian certification system register GOST R.
Receipt of the russian certificate of compliance and license certifying the right to use the russian certification mark (or marking the products by the Accordance Mark). Inspection and control of stability of the certified product characteristics (parameters), certified manufacturing process, certified quality system (if it is required by the russian certification plan).